Team Terra colours up your back end! With our new themes, you decide about the look of your plentymarkets user interface. Read in this article how you master this colourful new feature. You’ve known plentymarkets for years. Its functions, its workflow, its look. But have you ever imagined how it would be to design yourself everything you see? With the coming of Christmas time, we take the first step towards fulfilling this wish! Now you are in control of how your plentymarkets user interface looks. You probably have already noticed the new button colours, but did you know that you can bring the overall colour pattern from the dark sight to the light side of the force? Or that you can choose to which degree the buttons are coloured? All of this is possible now, thanks to our themes. In the following clip you can see how it works. Feel free to try it out and let us know in the plentymarkets forum how you like it or what options you are missing to make it your back end. As you can see, we added a little bonus to the purely functional adjustments. 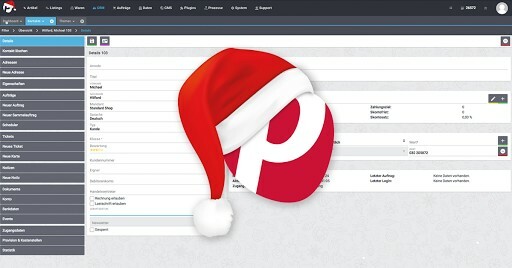 With a click on ‘Christmas’, you can get into the Christmas groove while working in plentymarkets. From now until New Year, we will not release any major implementations so you can concentrate on the holiday sales. For 2019, we have planned further themes options and you will be able to personalise the user interface even more. Step by step, we will offer colours, fonts and other options. When will we do what? That depends on your feedback, so keep it coming.